With the busy Poinsettia growing season ramping up, now is the time to start thinking about what you can do to maximize your chances of a healthy, profitable season. Poinsettias are susceptible to many diseases and problems throughout the growing season, but if you take care of them, they will take care of you. As one of the few greenhouse crops reliably and abundantly sold during the final months of the year, Poinsettias account for the lion’s share of sales during that time period. According to the USDA’s Floriculture Crops 2014 Summary, the value of potted Poinsettias totaled $141 million that year. No one wants to re-live the Xanthomonas crisis of 2010. In that case, early detection and vigilance allowed certain growers to succeed despite an outbreak of the disease. (Learn how one grower conquered an early and pervasive Xanthomonas infection in this Grower Talks article.) Make scouting for diseases a habit from the beginning. Know what to look for, and train your employees in detection and mitigation. Though Poinsettias can be challenging to grow, knowledge and unflagging vigilance on all fronts will be key to your success. 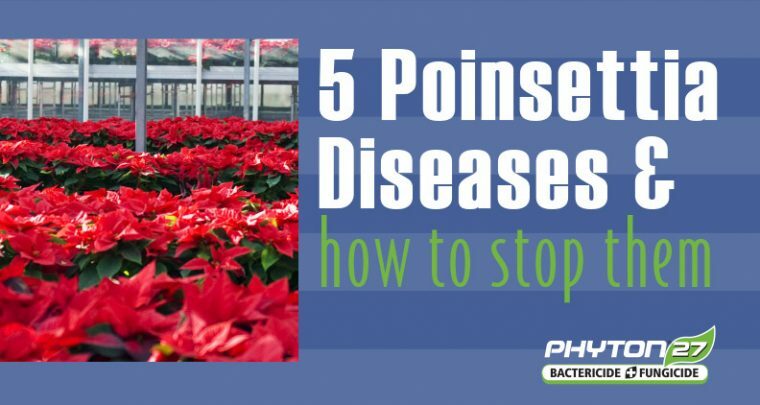 We’ve created a handy infographic to help you identify and manage five common diseases of Poinsettias. Use it yourself or share with your staff to train or refresh them in the detection of these common diseases.